The sewer system at your residential, commercial, and or industrial real estate is a mechanical entity, and much like any machine, it can break down at any time. This holds especially true if your property was built over forty years ago, as the sewer pipes are either at or near the end of their life cycle. This is due to the fact that in the past the pipe manufacturers used materials that are considered inferior when compared to today’s standards. There are various sewer repair methods available to you. It is essential to be are aware of the choices in order to make the best decision on which one is best for you. On that note, the following information will help guide you through the process of choosing an available sewer repair method in the Chesterfield, Missouri area. When most property owners or people in general for that matter hear the words “sewer repair” they immediately conjure up images of heavy-duty excavation equipment digging holes through their yard or grounds. That is because plumbing companies have been using the traditional excavation method for what seems like forever and a day. Although more technologically advanced methods are available, a lot of plumbers have yet to make the switch. This is because the plumbing industry as a whole is extremely slow at adopting new technology. The old school plumbing contractors are certainly set in their ways; even if it means that the outdated procedures take considerably longer and cost their customers’ significantly more money. Some businesses have the foresight to adopt new technologies but lack the money to invest in the training, equipment, and materials. Fortunately, there are a few plumbing contractors, like Nu Flow Technologies that have both the foresight and the funds to invest in the most cutting-edge methods. This is done in order to provide customers with improved sewer repair solutions that save you both money and time, not to mention avoid destroying your expensive landscaping and hardscaping. 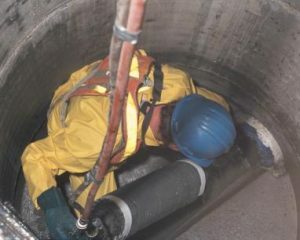 For example, trenchless sewer repair, particularly the Nu Drain pipe lining procedure only requires a small access point at one end of the sewer pipeline in order to make the necessary repairs. In essence, the plumbing contractor does not need to physically expose the pipes in order to fix them. The high-tech machine, invented by Nu Flow Technologies, incorporates the use of the small access point to install a tube into the existing sewer pipes. The tube contains an outer felt surface area that is saturated with a specially formulated wet epoxy resin, and an inflatable bladder system. Once the tube is fully in place it is inflated, which allows for the application of the wet epoxy resin to the interior surfaces of the existing sewer pipes. The tube is then deflated and removed from the sewer pipeline. This allows the epoxy resin to properly cure in place. Once it fully hardens a pipe liner, also known as a pipe within a pipe is formed. The new pipe liner seals off any cracks, chips, breaks, or holes in the existing sewer pipes and prevents any further damage to the line. It will last for at least a fifty-year period and costs less than half the price of the traditional excavation method. While traditional sewer repair can take multiple weeks to finish, the Nu Drain trenchless pipe lining procedure is completed within a day from start to finish, making it the ultimate sewer repair solution. We look forward to properly repairing your sewer system with our patented technology.